Author: Hoeg, Peter Set In . . . 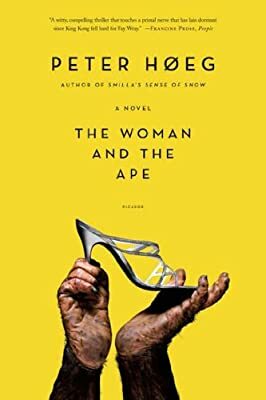 The Woman and the Ape is the story of a unique and unforgettable couple—Madelene and Erasmus. Madelene—a sleeping beauty drowsing gently in an alcoholic stupor—is the beautiful and disillusioned wife of Adam Burden, a distinguished behavior scientist. Erasmus—the unlikely prince—is a 300-pound ape. Erasmus is brought to the Burdens' London home after escaping from animal smugglers. In him Adam Burden believes he has discovered a hitherto unknown mammal, a highly intelligent anthropoid ape, the closest thing yet to a human being. If he is right, Erasmus will become the jewel of Burden's new zoo. But Madelene decides to save Erasmus, investing in her efforts all the single-mindedness she until now has reserved for drinking. The two fall in love—a love affair as emotionally and erotically charged as any female-male relationship could ever be. But Erasmus has come to England with a purpose, and eventually the couple must face the world they have sought to flee.